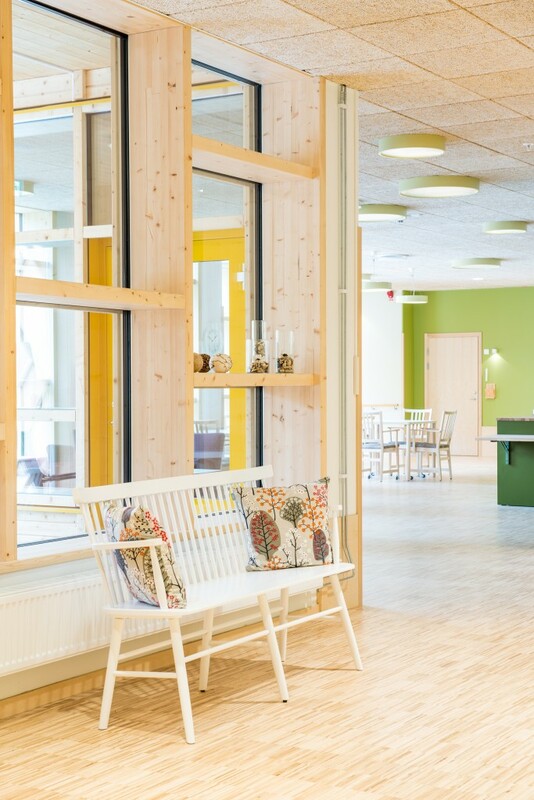 The design of care and nursing home facility Trädgårdarna (The Gardens) is based on research into environmental psychology and the impact of green environments for well-being. Here, residents are surrounded by a diversified indoor and outdoor environment that encourages integration, activity and exercise. “We have kept in mind what is healthy. 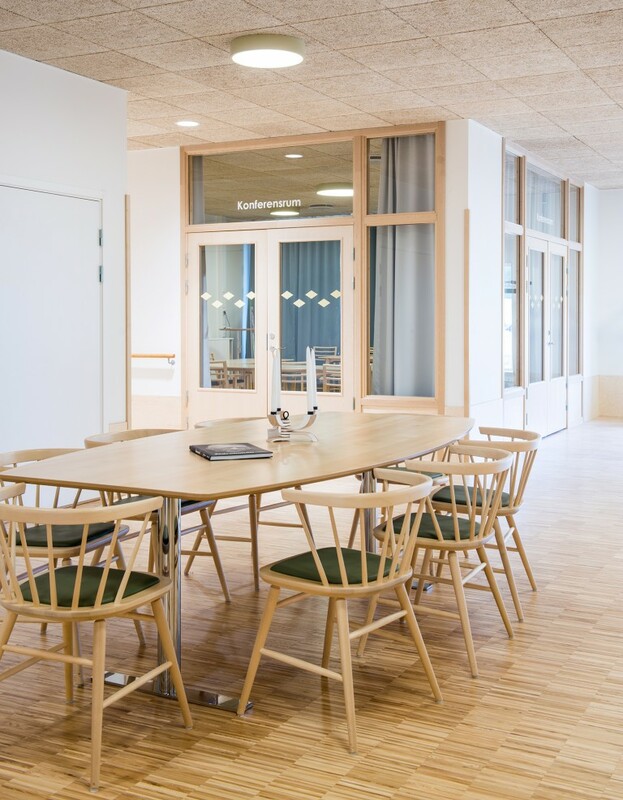 Independence and being able to move around freely in green environments instils a sense of calm and an improved feeling of health,” says Linda Björn from Marge Arkitekter. 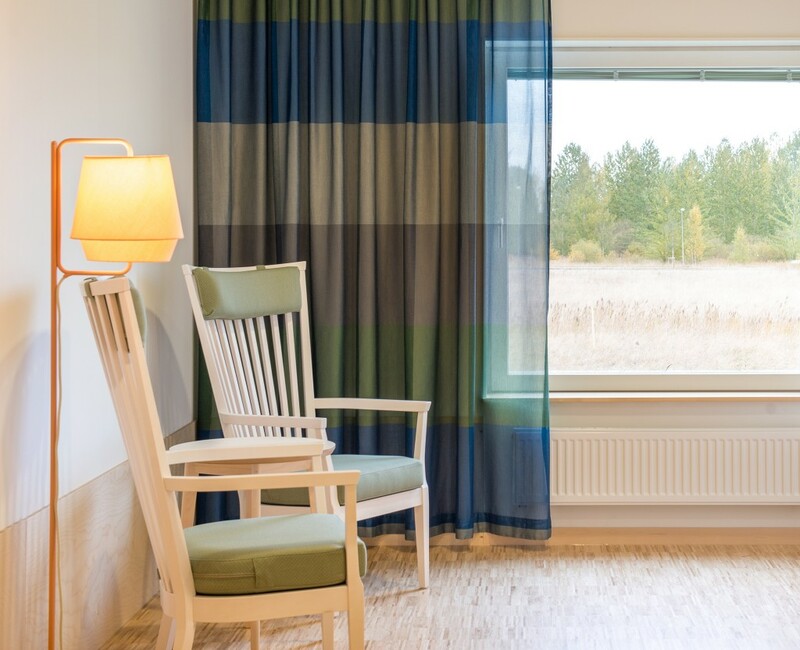 On behalf of Örebro Municipality and in collaboration with landscape architects LAND Arkitektur and Input interior, they have created a modern care and nursing home facility on the outskirts of Örebro. 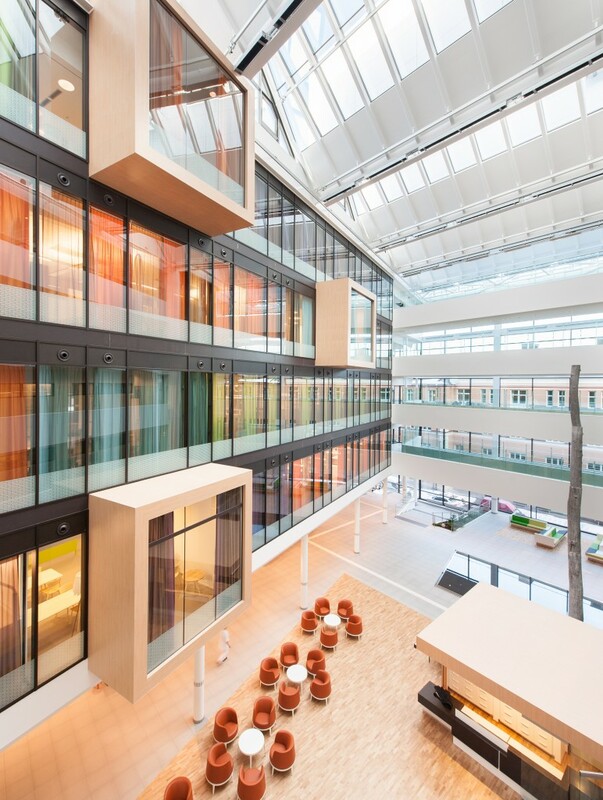 Surrounded by open areas, the large two-storey building has made good use of the site. The façade picks up the green and yellow hues of nature in an eye-catching cross-stitch pattern. “There are plans to develop adjacent land, but no one knows for certain what form this will take. 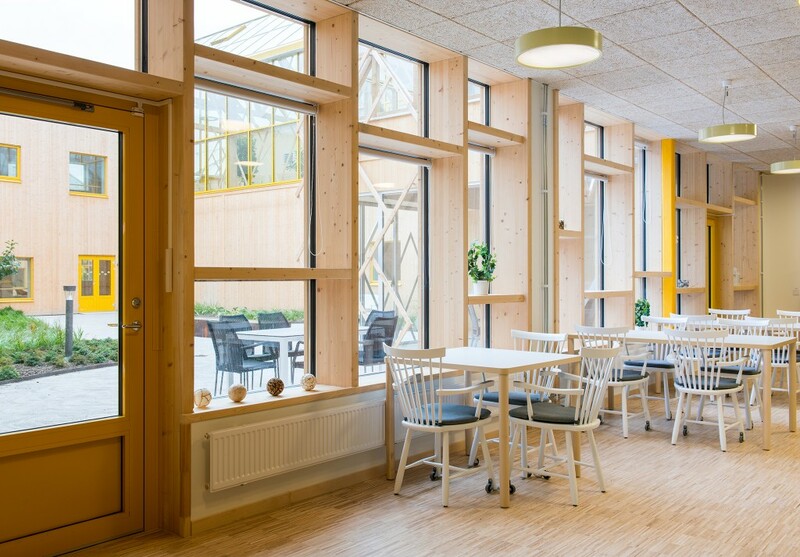 In order to create quality outdoor environments independent of plans for the surrounding area, we came up with a cloister-like concept of safe, shady inner courtyards, which residents can access on their own,” says Alf Orvesten from LAND Arkitektur. The concept resulted in three inner courtyards designed to fulfil the residents’ varying needs for impressions and activity. The smallest courtyard is a calm and peaceful setting, where residents can enjoy the flora, walks along the soft bark paths, and rippling water that attracts insects and bird life. The medium-sized courtyard combines areas for celebrations and large gatherings with tranquil nooks and crannies. Between two of the buildings is the largest and busiest courtyard, adjacent to the restaurant. 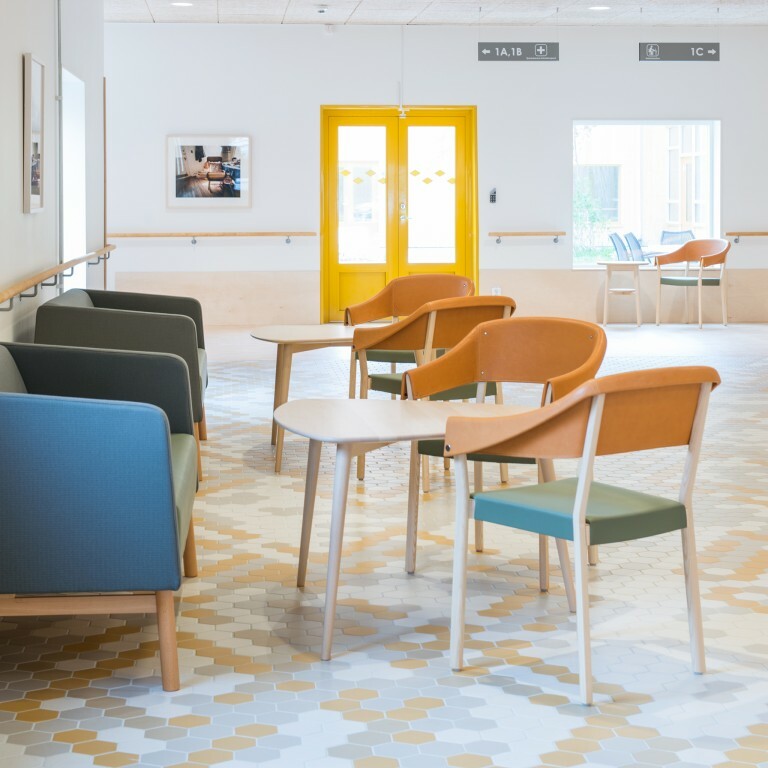 Integration and activity is the central focus here, and residents have access to an outdoor gym, space for keep-fit sessions and yoga, croquet and areas for socialising. 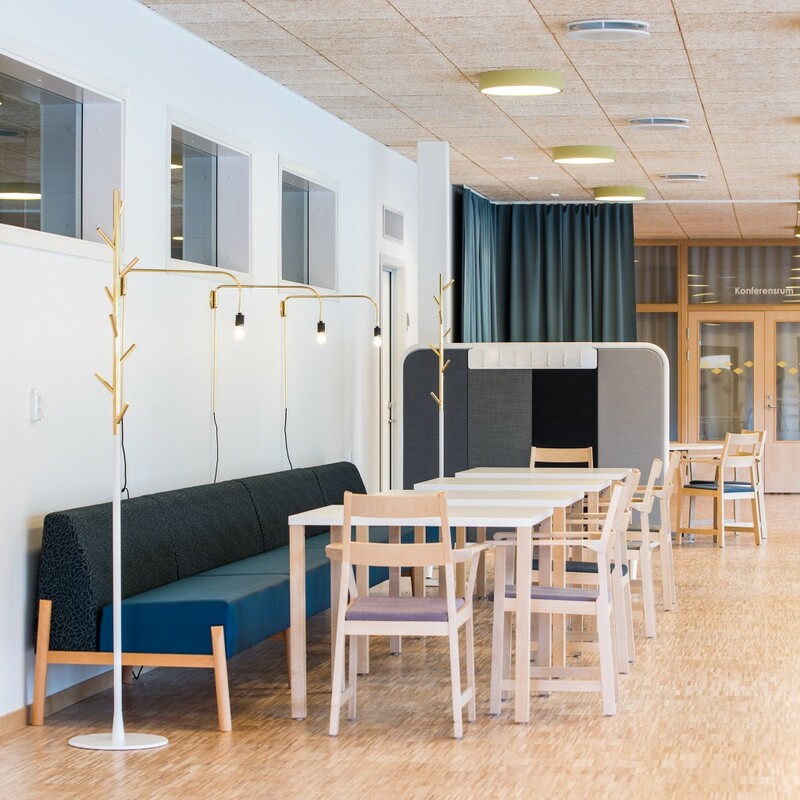 Indoor and outdoor environments interact and the spaces are also designed to promote activity and stimulation. “The interior design is varied to be suggestive of a home environment. We have picked up the green and yellow from the façade and once again incorporated warm wood materials into the interior. Integration is a matter of getting those living here to feel involved. There should be areas for meeting up and active spaces for a variety of uses to ensure meaningful everyday living. “We have deliberately created an informal meeting place at the entrance adjacent to staff rooms, the restaurant and the delivery entrance. It’s a place of constant life and movement. It has become a popular spot that promotes integration in a natural way. 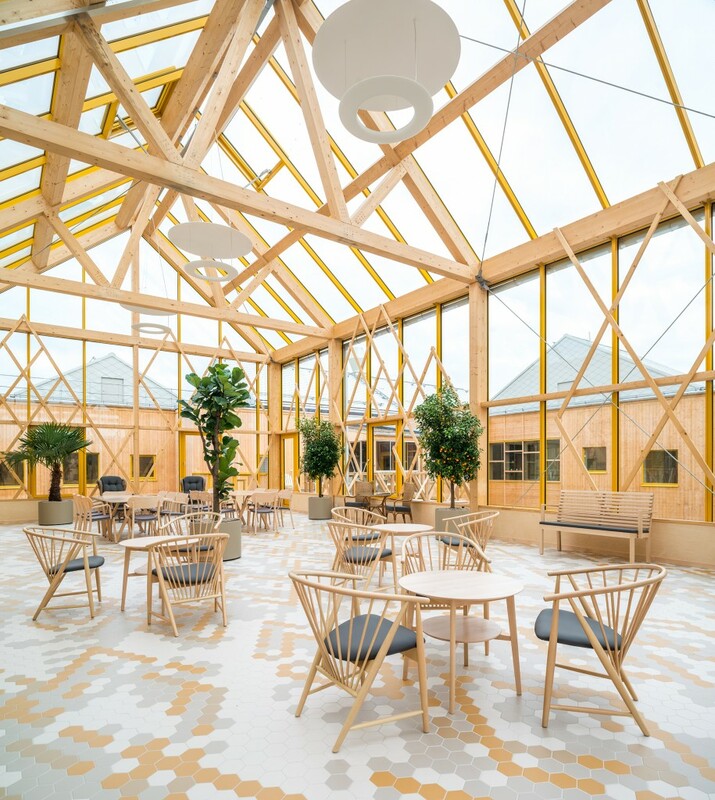 The beautiful conservatory serves a similar purpose. 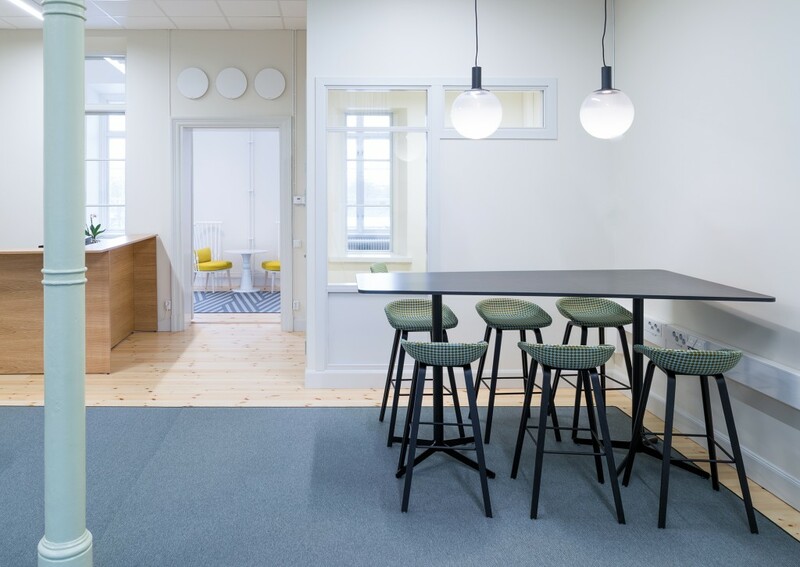 At the outset there was no documented need for these spaces, but in hindsight they are utilised to the full, which is really great,” concludes Linda.